When I started managing The Daydream Club in 2012, the band and I had a clear idea of what success meant. We needed a record label, radio play, a ton of live shows, glowing press reviews, these things combined would deliver critical acclaim, fame, album sales and income. We were not naive, and had our eyes open from the start. We knew major label revenues had always been built around popular music for the masses. There was a clear template that worked and that wasn’t going to change. We were fine with this, while we quickly realised One Direction fame would allude us, we still believed there was enough room as a mid-tier artist to forge a sustainable living from music. Since day one, we have been encouraged to continue following the traditional path to success. The old industry voices told us “play those gigs, chase that radio play, garner that press and success will follow.” So that’s what we did. The Daydream Club have now released two albums, one EP and there are plans for a third album later this year. While planning the release of latest album the ‘Piano Project’ we had an epiphany. After four years we concluded the old path to success was no longer relevant or viable. After looking at our accounts we calculated that we were paying approximately £5,000k to promote each release. That covered, recording, mixing and mastering, artwork, video production, distribution, radio pluggers, PR companies, and live tours. For an independent artist like The Daydream Club, landing a place on a national radio playlist is close to impossible and regional radio support although appreciated is frequently limited to one-off late night plays. This makes it almost impossible to build fame, momentum or sales. We concluded the use of traditional paid promotional channels was unaffordable and unsustainable. We couldn’t compete with major label backed artists for radio playlists, wall to wall press coverage and well paid live opportunities. We couldn’t afford to keep on throwing away money for scant returns. Luckily for us changes to music consumption mean fans no longer have to wait for radio to play a song, they can go and find what they want, when they want. On demand listening via Spotify was ideally suited for us. Based on these observations we set about defining a new set of rules for promoting The Daydream Club. It started with our existing material and our existing fan base. Our approach represents a small but significant change from the traditional model, which focuses on paid channels (Radio, Press, TV) to promote a new release to the widest possible audience, before trying to convert new fans to purchase the music. Rather than building fame and hoping people follow the breadcrumb trail from radio or press to store, we decided to start with the existing fans and use their advocacy to grow out. In chasing the traditional music industry route where fame comes first, we were in danger of getting too far away from the fans. On the rare occasion that The Daydream Club’s music was played on the radio we were asking people who don’t really care, to care, and then make the effort to track The Daydream Club down on and offline to buy the music. Funnily enough, very few did. Almost all of our paid promotional effort was un-targeted wastage. With our new focus, the plan is simple. Start with the active music fans, the people who already care and love our music. We encourage and reward them for doing what they love doing. Talking and recommending music to their friends and family. We now have two clear objectives, and everything we do on our owned channels like Facebook, Instagram and our own website supports these two objectives. We do this by diverting a fraction of the money we were wasting on radio pluggers and so-called music PR experts to promoted posts on Facebook, and spend time optimising the look of the content we share to ensure maximum standout and cut through in the news feed. The investment focus and burden of financial return is no longer just on one new track. Our new promotional approach always starts with the band, not an individual single. We encourage fans to listen or add any of the bands 39 tracks to a playlist to drive direct income. The concept of new music has changed, new on Spotify simply means ‘new to me’ with Spotify curated playlists containing music by theme not by release date. On the example below The Daydream Club’s track ‘Found’ sits alongside tracks that span an 11 year release date period. For most listeners, it’s all new music, because it’s new to you. The music industry’s obsession with the next new single and release date is out of step with how fans consume music online. There have been lots of negative articles written about the low-income bands generate from Spotify, but in fairness the income per stream is never going to compare to one physical sale, but Spotify offers a lifetime of value each time a track is streamed. What’s more if Spotify is used to support your catalogue not just a new single, the cumulative streams soon add up. The Daydream Club have 39 tracks that earn them money. How many retailers only sell one product? In the old model we were pinning our hopes on one track generating PRS income from radio play, and the outlay on promotion was never recouped. 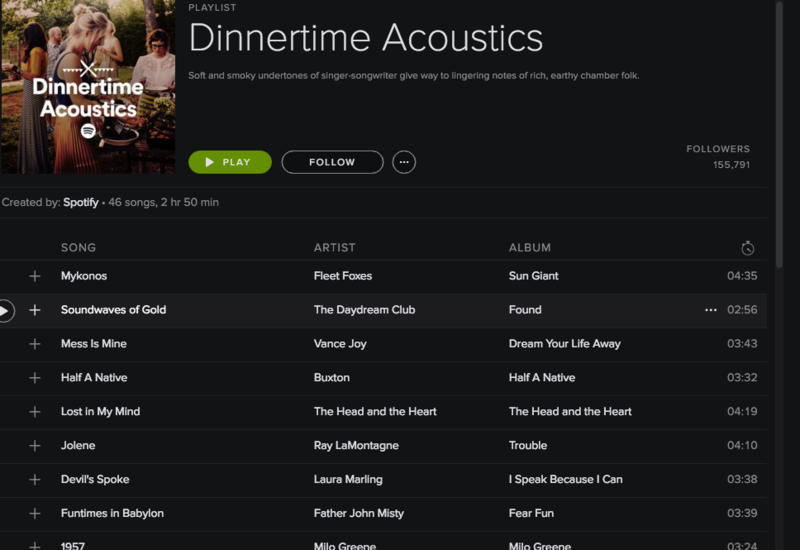 Thanks to the fans and Spotify The Daydream Club now appear on over 206,000 playlists. They recently passed one million streams per month, and have over 8 million streams in total. This generates a sustainable income for the band. This has all been achieved with a fraction of the budget previously wasted on radio pluggers and PR agencies. For The Daydream Club earning an income sufficient to allow them to continue to make music means they are successful. After years following the traditional path, we have found a model that works for them. It starts with music and fans, not fame.